Enjoy this stylish sofa for comfort and sophistication in your living room. Exposed wood feet and the sophisticated shape of the flared arms complement the look of this fantastic sofa. 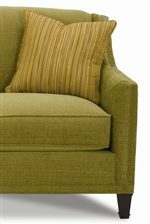 Two plush down pillows with welt cords add softness to each end of the sofa. Snuggle up on this sofa to enjoy socializing with friends and family or simply an activity such as watching TV. The Gibson Sofa with Exposed Wood Feet by Rowe at AHFA in the area. Product availability may vary. Contact us for the most current availability on this product. The Gibson collection is a great option if you are looking for Transitional furniture in the area.